Nathan P. Gilmour , 27 June 2014. I doubt that he would ever admit it (he goes to some length to note that he’s spent eight years researching this book), but I can’t help but wonder whether Bart Ehrman put this book before the public in order to make a bid to top Reza Aslan’s Zealot in the public’s conversation about the historical Jesus. (I reviewed Aslan’s book last year here at the Christian Humanist.) Like Aslan’s book, Ehrman’s goes to some length to establish that history, as a discipline, comes to some conclusions about Jesus of Nazareth that don’t fit well with popular American conceptions of Jesus, the Son of God, Second Person of the Trinity, and so on. But unlike Aslan’s book, Ehrman’s engages with a broader range of contemporary scholarship, explains in more detail the ways in which modern scholars go about evaluating the historical weight of different parts of the Bible, and overall pays more attention to the particularities of Jesus that made his messianic movement rather than other Jewish holy men’s become the world religion that, among other things, gave the world the historical context in which modern universities make sense. In other words, this is a better book than Reza Aslan’s, and I appreciated that at every step. Reading through this book reminded me in good ways of the discoveries I made as a student in college- and seminary-level New Testament classes, and it gave me occasion to remember and to rethink some of the things that I first learned then. The nice thing about books like How Jesus Became God is that their philosophical commitments are relatively easy to find, making the book an occasion for examining one’s own views of history, the relationships between miracles and history and evidence and such, and otherwise to think carefully about Jesus. And as I’ve said more than once and in more than one context, the best books are not those that too readily provide obvious answers but those that force one to ask questions that one had not before considered. This book certainly does that job, if one is willing to disagree sometimes with words in print. What Do You Mean, “Son of God”? One of the best features of Ehrman’s book is the attention he pays to the broad spectrum of narratives and backgrounds that make the phrase “Son of God” so interesting as a subject of study and so difficult as a relationship between historically-developing concept and a doctrine of the Christian faith. Ehrman spends a fair span of pages exploring not only Greco-Roman narratives in which human beings are also divine but also Biblical and Second-Temple Jewish moments in which the categories of the human and the divine become something other than distinct. On one side obviously there are the sons born when Zeus pursues and seduces pretty human girls, but there are also stories like that of Baucis and Philemon, who become divine figures as a reward for their hospitality (20) and Apollonius, who becomes divine through his dedication to philosophy (12). On the Jewish side there are apocalyptic figures like Enoch from the Book of Enoch (60), but even in the canonical Biblical books there are figures like the king of Jerusalem, who is in some sense begotten of God according to Psalm 2 (77) and Moses, who explicitly says that he will be as a God for Aaron (81). Since the world of the New Testament finds its center in Jerusalem but extends to the heart of Greco-Roman cultural and political power, “Son of God” in such a world is not a readily-established category but an ongoing literary negotiation, and How Jesus Became God does a good job of exhibiting that complexity. In my own teaching, mainly in church contexts, I’ve also spent some time noting that “son of God,” depending on whether one is in Ephesus or Rome, in Jerusalem or at Qumran, would have been a term that needed context, not something that an early Christian could assume that everyone knew (or even that early Christians themselves knew in its fullness). It’s not any great surprise that Christian thinkers and writers for upwards of four centuries had before them the tasks of defining and refining what those categories meant; after all, they were both complex in their origins and hard to establish conceptually. However, even with all of this flexibility, Ehrman ends up concluding that Jesus, the historical figure, ultimately could not have seen himself as “God” or “Son of God” in any of these respects. His arguments against that self-understanding have their roots in German-style, historical-critical Biblical studies, and revisiting that project was perhaps the most interesting part of this endeavor for me. When I was a freshman at Milligan College, I learned my New Testament from David L. Matson, a professor I still remember as one of the best from whom I ever learned. Among the many new things I learned from Matson was the battery of questions that members of the Jesus Seminar (as well as other scholars) posed when speculating about which sayings in the four canonical gospels were Jesus’s historical utterances and which ones were the inventions of later generations. At the time, half of my years ago, those methods were nothing short of revolutionary: I discovered that New Testament scholarship was not mere reproduction of established narrative but a complex practice, parts documentary investigation and speculation about ancient authors’ motives, parts rhetorical contest and positioning rival theories as inadequate. Re-engaging with Ehrman’s presentation of the three big methodological assumptions of the Jesus Seminar (he calls it “New Testament Scholarship” generally, but the continued activity of N.T. Wright makes me cautious that such a label is overly broad) was a fascinating exercise, largely because of the questions that occurred to me in my late thirties that didn’t when I was a teenager. Independent Attestation (95 et al. ): If a saying of Jesus appears in a plurality of written sources, then that saying is more likely to be historical than those saying appearing only in one source. Ehrman counts the baptism of Jesus (which appears in all three synoptics), the crucifixion (all four gospels), and certain apocalyptic sayings in this category, while he discounts the “I am” sayings of John for the same reason. (He agrees, basically, with the Jesus Seminar on all of these points.) The criterion seems reasonable on its face: when only one source features a saying or an episode, there’s some reason to wonder why other texts do not see fit to repeat it. However, as Ehrman himself notes, the textual sources available to a historical Jesus scholar are few and far between, and uniformly they’re “insider” documents, texts written by Christians and for Christians, for the first couple centuries at least. So the more skeptical version of myself, in 2014, wonders whether multiple attestation and, more importantly, lone attestation might be a function of textual contingency rather than historical priority. To put it another way, since the extant Christian corpus of the first century is so sparse, I have a hard time saying dogmatically that there’s only one source with “I Am” sayings; for all I know, there might have been more that got destroyed in fires, floods, or other bibliographical disasters.Moreover, relatively few New Testament scholars deny that, as a matter of probability, there were likely many streams of oral tradition and moments of congregational teaching which simply never became part of the modern age’s extant written record. Beyond that, in many of his examples through the book, Ehrman posits, for instance, that Mark shares a certain bit of narrative with the hypothetical Q source (95), a move that requires a reader to rely on comparisons between extant and hypothetical sources in order to determine the reliability of an episode.For those reasons, I came away from Ehrman’s treatment of this criterion not confident in its ability to tell “historical” matter from “invented” but more convinced than before that New Testament scholarship is inherently a literary and rhetorical investigation, reading closely what we have but (when we can restrain ourselves) not assuming that what we have represents all the communication about Jesus happening on the ground in those early Christian decades. Dissimilarity (96 et al. ): If the content of a saying or an episode differs from the core beliefs of the community transmitting the episode, then that saying or episode is more likely to be historical than those whose content agrees with the doctrines of the early Christians. Ehrman points to sayings of Jesus that he reads as “apocalyptic” (which he interprets rather narrowly as the utter and final termination of historical change) as meeting this criterion, saying that, because the early Christians would have been embarrassed to invent this material (history continues to wreak change, after all), it’s more likely original Jesus-material. On the other hand, he finds the moments when Jesus foretells his own crucifixion to be inauthentic according to this criterion, noting that such sayings would validate, not scandalize, the early Christians, who came to regard the crucifixion as the destiny of Jesus rather than an unfortunate turn of events. (Again, none of this disagrees with standard Jesus-Seminar scholarship. )This criterion strains credulity more than the first one, largely because it assumes on one hand a Platonic disregard for textual fidelity and on the other a sort of incompetence with regards to carrying out the agenda of a growing religious movement. Plato, in Republic, has Socrates advocate a sort of Bowdlerization of the text of Homer for the sake of educating the guardians of the good city. Socrates would excise those episodes that have heroes or gods behaving badly, driven by lust or cowardice or any vices of any sort, so that the “Homer” that remains for the education of the guardians would feature only good gods, good heroes, and good examples. (To his credit, Aristotle theorizes a broader notion of what good literature can do in the Poetics.) So in the hypothetical Socratic Homer, the text would not feature any embarrassing bits, whereas the extant text of Homer decidedly does. That makes some sense, since Plato never was the primary curator of the text of Homer, but it would mark Plato as somewhat of a dolt if we knew, historically, that he had a mind to edit out the embarrassing bits of the Odyssey but ultimately did not read carefully enough to catch those passages.What Ehrman would have us believe (and he’s not making this up; it’s the standard way that folks teach New Testament studies in the late-modern academy) is that early Christians were brazen enough to invent Jesus-sayings in many cases but either too lazy, too superstitious, or otherwise incompetent to excise (a la Socrates) the remaining moments that prove “embarrassing.” Moreover, Ehrman’s treatment of dissimilarity assumes that the sort of reading that a twentieth-century German professor (as opposed, for example, to that offered by a sixteenth-century Augustinian monk or an eighteenth-century New England preacher), is self-evidently the single most valid reading, meaning that, for instance, “the end of the age” of which Jesus spoke can’t be a spiritual transformation of world history (in which the Kingdom is both already among the faithful and not yet among the nations more broadly) but must be something more like the cataclysm that modern folks imagine, what with our knowledge of astronomical cycles and geological phenomena. In other words, there’s some historical Chauvinism at play in the way that dissimilarity gets deployed, and even when it does function honestly, it assumes too much about the transmission process. For a strong alternative to the dogma of dissimilarity, I recommend N.T. Wright’s take on things in The New Testament and the People of God. Wright’s contention, which is neither the Jesus-Seminar consensus nor a simple reversion to Fundamentalism, suggests that the person Jesus is just a viable a candidate as are the early Christians for originating what later becomes the sayings of Jesus in the synoptic gospels. In fact, Wright suggests, continuities between Jesus and early Christianity might be superior to moments of discontinuity as markers of historical authenticity precisely because they mark those teachings, narratives, and symbols that emerge in the Christians’ version of Jewish Apocalypticism but not that of, say, the Qumran community or the early Rabbinic movement. With that said, I don’t think that Ehrman’s project in How Jesus Became God is to break new ground but to present an introduction to the Jesus-Seminar way of doing historical Jesus scholarship, so the fault here is not with Ehrman’s book so much as with the tradition within which Ehrman writes. Contextual Credibility (98 et al. ): This is the criterion that Reza Aslan’s Zealot most readily championed. If the content of a saying or episode is intelligible within a first-century, apocalyptic Jewish context, then that episode’s content is more likely historically authentic than would be episodes’ content that differ radically from fist-century apocalyptic Judaism. On first glance, this would seem to contradict the second criterion. After all, if dissimilarity is the mark of authenticity in one direction, then similarity doesn’t seem like it should be the coin of the realm in the other. But beyond that, as I noted in my review of Aslan, such a criterion discounts the possibility that Jesus himself might have been a source of historical change. The commitments involved in such a denial are complex, but at the least they assume that Jesus was illiterate (which is a speculative claim rather than one rooted in actual documentary evidence), that an illiterate person cannot have new ideas (which is a claim that says more about literate people’s sense of class-superiority than about Jesus, as far as I can tell), and that therefore that the real revolutions in the consciousness of those who followed Jesus (documented well in David B. Hart’s book Atheist Delusions) must have come not from the illiterate peasant from Galilee but from the educated scribal class of diaspora Judaism. (I’ll leave to our readers to judge whether the Chauvinism that I see is really there in the methodology.) For my money, the possibility (that Wright documents in New Testament and the People of God) that Jesus himself might have been the source of the revolution is just as plausible as the theory holding that Jesus could not have been, and it requires less credulity that the real brains behind the operation were content to remain historically anonymous, preferring instead to point backwards to an otherwise-unremarkable peasant revolutionary. I rehearse all of these not simply as an exercise in re-examining what I learned as a younger man (though that’s fun in its own right) but because, even for those who no longer agree with the methodological consensus of the Jesus Seminar (as I don’t) stand to benefit from clear articulations of one living tradition within the field, and Ehrman without a doubt provides that in this section. Once again, his project here is not to establish something never-before-written but to bring to a popular audience the consensus position of a powerful group within the guild. Set alongside something like N.T. Wright’s The Challenge of Jesus, this section of the book stands to be an excellent introduction to the difficulties of talking about “the historical Jesus” and all of the intellectual questions that involve themselves in distinguishing such a figure from the Jesus of American piety. When I set those three pictures of Jesus (Ehrman’s/conventional SBL, Wright’s, and American evangelical) next to each other, I come out the other side largely favoring Wright’s picture, but that’s not to say that everyone will. But that’s what history’s about, as far as I can tell. When Ehrman turns to the resurrection, a reader with some background in Enlightenment philosophy will easily spot the assumptions that frame his readings of the great works of Jesus. When it comes to the life of Jesus up to and including the crucifixion, Ehrman is a fairly predictable Jesus-Seminar man. Once Christians start singing the Resurrection, he becomes a disciple of David Hume in a relative hurry. Ehrman begins his treatment of the resurrection noting (rightly) that, among Jewish apocalyptic movements, Jesus’s followers, as a group, were unique in that they claimed that their Messiah had risen from the dead (131). He points to evidence in the Pauline epistles that certain poetic formulae, which Paul seems to be quoting rather than inventing, already make reference to the Resurrection, indicating a very early date for that claim (138). And as the book goes on, Ehrman repeats at every turn that resurrection is a cornerstone of what eventually becomes Christianity and that, without claims about the resurrection, Jesus would be simply one failed messiah among many, joining the long list of historical footnotes that litter the Roman Imperial period. When he shifts his focus from Christians’ claims about resurrection to the event that Christians call the Resurrection, on the other hand, Ehrman’s philosophy becomes somewhat more ambiguous. When at first he addresses the question of whether Jesus Christ lived, then died, then lived again, Ehrman demurs, asserting that “there is no way for historians to know one way or the other, using the historical approach to establishing what happened in the past” (146-47). Ehrman roots such epistemological abstinence in the fact that academic history is a pan-religious phenomenon, that historians with philosophical objections to the actual occurrence of miracles ought to be able to work alongside Muslims, Latter-Day Saints, and evangelical Christians, and all of them should be able to do history and have it recognized by the others (147). Thus, while historians can and should write about people who believe in miracles, the occurrence or non-occurrence of miracles themselves seems simply to be off-limits for historical assertion. So he seems, in these passages, somewhat committed to a postmodern approach to history, avoiding the metanarratives that would assume every inexplicable event to be reducible to fraud, psychosis, hallucination, or other materialist explanation. That Ehrman exhibits philosophical convictions ultimately does not make the book a failure; his exhibition of those convictions, however, does indicate that a thoroughgoing skepticism is darn hard to maintain. Ultimately Ehrman does not table questions of “belief” so that he can focus on matters of “fact.” Rather, Ehrman’s frequent invocations of “historical inquiry itself” and “the historical point of view” are, like similar invocations made by Reza Aslan and others, shorthand for certain, contingent, historically intelligible philosophical commitments, and in Ehrman’s case these seem to be those of David Hume. Ultimately Ehrman is going to write about alternative explanations as “more probable” than divine actions, and someone like me is, in turn, going to turn the historical spotlight on the one giving those possibilities such priority, noting that the philosophical commitment to agnosticism seems to determine beforehand which possibilities are really possibilities. The plain consequence is (and it is a general maxim worthy of our attention), ‘that no testimony is sufficient to establish a miracle, unless the testimony be of such a kind, that its falsehood would be more miraculous, than the fact, which it endeavors to establish; and even in that case there is a mutual destruction of arguments, and the superior only gives us an assurance suitable to that degree of force, which remains, after deducting the inferior.’ When anyone tells me, that he saw a dead man restored to life, I immediately consider with myself, whether it be more probable, that this person should either deceive or be deceived, or that the fact, which he relates, should really have happened. I weigh the one miracle against the other; and according to the superiority, which I discover, I pronounce my decision, and always reject the greater miracle. If the falsehood of his testimony would be more miraculous, than the event which he relates; then, and not till then, can he pretend to command my belief or opinion. The elegance of the theory is undeniable, and beyond that, it has the advantage of treating the world as unified: there’s no pretense of shuffling off matters of “faith” (and anyone who’s taken introductory theology classes knows that such a use of “faith” is woefully inadequate) matters about which human beings differ. Instead, Hume recognizes that historical disputes are inherently rhetorical exchanges, and he makes the case, based on probability rather than experimental repetition or logical necessity, that miracles are, as a category of claims, less probable than claims of fraud, delusion, and other more-common happenings. To be fair, I tend to be a Humean about as often as Ehrman suspects that Christians are. When I hear stories of people who got “a word from God” that happen to coincide neatly with their own politics and piety, my tendency is to say that they’ve had an emotional/psychological experience, not that there’s been an Abrahamic moment. I’ve disciplined myself to examine these instincts when they take over, and I’ve become more open-minded as a result, but the initial impulse is still there, if I’m honest. And to grant another point, I’m reticent to dig much into the mechanical “how” of Biblical signs and wonders; I’m more interested in the rhetorical force of miracle-narratives than I am in explaining the processes by which a blind man is healed or a demon cast out. (This is one of the main reasons that I enjoy listening to Homebrewed Christianity’s “Theology Nerd Throwdown”: the process-thought movement in theology engages in just such speculation, and it’s good fun to listen to them attempt explanations of the miraculous.) Such is not to say that Ehrman himself is necessarily right or wrong for being a Humean or that he should or should not be ashamed of the same. It is to say that he should acknowledge his own philosophical convictions openly rather than making the reader play detective trying to find them. The second half of the book (which I will treat far more briefly) gives a good historical summary of the ways that the New Testament and the first few centuries of Christian writing deal with the claim that Jesus of Nazareth is in fact God. Some of his claims, particularly about the New Testament, rely on the methodological dogmas outlined above and thus don’t convince me as he might want, but for the most part, he does show his work through this section. When he gets to figures like Justin Martyr and Tertullian, his treatments rely a fair bit on his Humean philosophy and thus don’t convince me as he might want, but for the most part, he does show his sources. Ehrman does make some squirrelly claims late in the book, first of all that Orthodox Christians tended to manipulate the Bible, adding things that support their dogmas and excising things that did not, while those branded heretics tended not to (294). Readers who know New Testament criticism no doubt will recognize the criterion of dissimilarity operating here, perhaps thrown into greater relief by the scope of the conspiracy-theory credulity that has to be in place as the centuries roll along. Beyond that, of course, Marcion’s own alterations to the gospel of Luke, in an attempt to establish an anti-Jewish Christianity over against the Old-Testament-reading Orthodox, are well documented, making me at least wonder whether Ehrman’s own biography as a former evangelical isn’t leading him, by the late stages of the book, into claims that his otherwise careful historical investigations should shield him from. Beyond that, Ehrman makes a move not unlike Aslan’s in Zealot when he claims that he, as an agnostic Bible scholar, is a follower of the historical Jesus (as opposed to the dogmas of the Church) in ways that evangelicals often are not (354). Such a choice, rhetorically, might have the benefit of tweaking the right sorts of noses, but it largely ignores the work of the rest of the book. A project that establishes that Jesus, the historical figure, was a mistaken proclaimer of a cosmic annihilation that did not in fact come to pass, then claims that the author of the study has reason to be a follower of that failure, strikes me as an odd testimony to the lingering cultural capital of Jesus, even among those most dedicated to shifting the religious engine of Christianity away from the Galilean. Time will tell, but my hunch is that, without a Fox News interview that goes YouTube-viral, this book will not become as well-known as Aslan’s. And that’s a pity, because it’s a better book than Zealot. I can recommend this book to folks who want a brush-up on their New Testament Introduction, to folks who are interested in seeing a fairly conventional New Testament professor’s take on historical Jesus questions. This book doesn’t break new ground the way that N.T. Wright does, but that’s ultimately no crime for a book. I will reiterate that the best way to read a book like Ehrman’s is to go in not with an eye for where one can “prove him wrong” or to get “ammunition” for later deployment against those who differ but paying attention to the large arguments that animate modern Jesus-scholarship. Ultimately the choice that a careful reader of Ehrman or Wright or even Aslan must make is what sort of story one tells about the world, whether in fact divine action is an intelligible category, historically speaking, and whether it’s better to table claims of divine act until Sunday morning worship starts; whether it’s better to acknowledge one’s convictions at the outset, then tell a full-bodied story (which integrates what Ehrman wants to segregate into zones of “faith” and of “history”) as truly as one can muster,; or whether it’s better to engage the reading and writing and conversation of history in ways that I’ve not imagined here. Nothing is settled when one goes in with those commitments, but then again, the Son of Man does not have any place to lay his head either. In the spirit of disclosure, I note here that the copy of the book I received was a complimentary review copy from HarperOne and did not come with any expectation of a positive review. ChenBuLei When I teach intellectual movements and moments, I do try to find the contradictions and paradoxes and such within, so yes, I do tend to view things like the Renaissance, the Enlightenment, the Postcolonial movement, and other such phenomena not as monoliths to “support” or “oppose” but as countries to explore. And with regards to Hume, if I’m honest, I have to admit that, when I hear stories of faith-healing and exorcism and such, my own instinct is to account for such things in terms other than the ones in which the narrator narrates ’em. Now I have tried to discipline myself, especially in the last ten years or so, to listen more attentively to the terms in which folks tell their own stories as well as the content of those stories, but it remains a discipline; I’m not a “natural” at hearing such things by any stretch. The interesting ethical question, for my money, is whether such disciplined listening strengthens some virtues or whether such disciplined listening diminishes certain virtues. I’m inclined towards the former, but I know that folks who operate within a Humean paradigm would consider such things at best to be soft-minded and at worst, harmfully superstitious. But as you know, since you listen to us, precisely those root-level fights over what’s real and what sorts of people can get at reality are precisely where I find the intellectual life most interesting. nascent church built its orthodoxy. 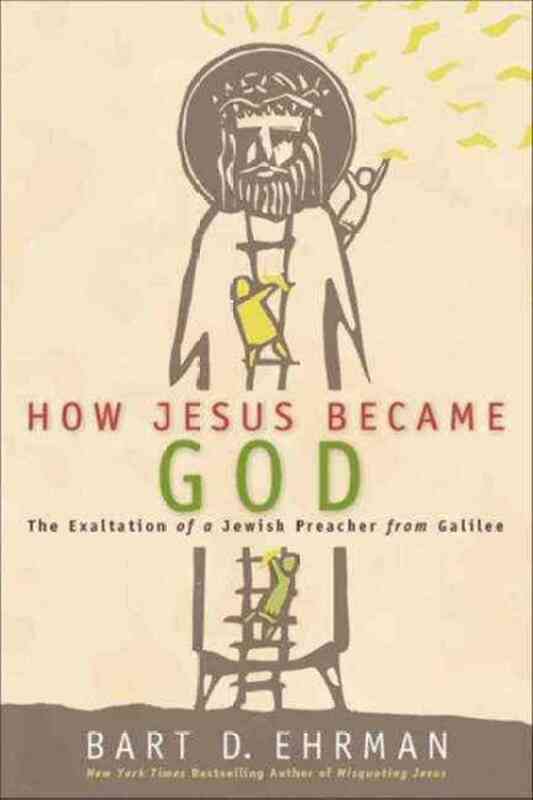 Ehrman’s How Jesus Became God</a>. Thanks for the reply, pgoggins. I wonder, though, whether sapiential and apocalyptic discourses are mutually exclusive as you frame them here. Walter Brueggemann has made the case more than once that Apocalyptic might be more intelligible as the literary outgrowth of Wisdom literature rather than Prophetic oracle.